Now faith is the assurance of things hoped for, the evidence of things not seen. Tender Mercies looks like nothing on paper. The script by Horton Foote is spare and direct, and the dialogue seems to sit damply on the page: How long have I been here? Two days. How far is it to the nearest town? Four miles. Conversations are short, stripped of any color or imagery, and scenes are brief and focused. The film itself, released in March 1983, initially comes across that way, too. Director Bruce Beresford steadfastly refuses to do anything showy, turning the Texas desert of the storys setting into an empty, desolate place devoid of anything attractive. Playing out in elliptical bursts, the film starts quietly and stays that way throughout, ambling through its story of a washed-up country singer, Mac Sledge (Robert Duvall), who finds himself broke and hungover at a tiny motel run by Rosa Lee (Tess Harper) and begins working at the property to pay off his debt before sticking around and becoming a part of her life. Any given scene in the film doesnt look like much, and it probably wouldnt feel like much viewed out of context. Yet theres a fragile beauty in the way the film adds up to be so much more than the sum of its dusty parts, and the work as a whole is a powerful, earnest, lovely film about redemption, forgiveness, andin a manner more honest than almost any other American film of the modern erafaith. Tender Mercies belongs to that rare class of film that directly addresses religious faith not as a talking point or as a weapon to be used on the audience, but as a genuine component of the lives of its characters, without attempting to ignite that faith in the viewer or resorting to the extremes of piety or bitterness to make its spiritual point. It is, in every manner and method, honest, and its examinations of the small acts that define love and compassion are among the most insightful ever put to film. Its not surprising, though, that it looks so ordinary. Film can be an amazing medium for so many things, but its often terrible at exploring the micrometers of nuance that make up a change of heart. Its a medium of action, and belief is invisible. A film can communicate the aftermath of conversion, or convey relationships through conversations and acts, but the silent work of contemplation and kindling is harder to show. One of the reasons so many faith-based films feel so cheap and thin is that they ignore thisor worse, think that talking about belief is the same as showing it. They wind up delivering hollow homilies. Theyre also designed to do the very thing Tender Mercies never once attempts: proselytize. Tender Mercies looks like nothing on paper. The script by Horton Foote is spare and direct, and the dialogue seems to sit damply on the page: “How long have I been here?” “Two days.” “How far is it to the nearest town?” “Four miles.” Conversations are short, stripped of any color or imagery, and scenes are brief and focused. The film itself, released in March 1983, initially comes across that way, too. Director Bruce Beresford steadfastly refuses to do anything showy, turning the Texas desert of the story’s setting into an empty, desolate place devoid of anything attractive. 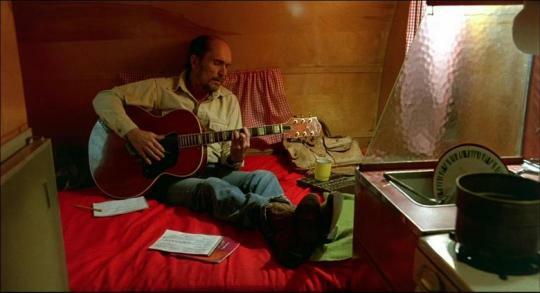 Playing out in elliptical bursts, the film starts quietly and stays that way throughout, ambling through its story of a washed-up country singer, Mac Sledge (Robert Duvall), who finds himself broke and hungover at a tiny motel run by Rosa Lee (Tess Harper) and begins working at the property to pay off his debt before sticking around and becoming a part of her life. Any given scene in the film doesn’t look like much, and it probably wouldn’t feel like much viewed out of context. Yet there’s a fragile beauty in the way the film adds up to be so much more than the sum of its dusty parts, and the work as a whole is a powerful, earnest, lovely film about redemption, forgiveness, and—in a manner more honest than almost any other American film of the modern era—faith. Tender Mercies belongs to that rare class of film that directly addresses religious faith not as a talking point or as a weapon to be used on the audience, but as a genuine component of the lives of its characters, without attempting to ignite that faith in the viewer or resorting to the extremes of piety or bitterness to make its spiritual point. It is, in every manner and method, honest, and its examinations of the small acts that define love and compassion are among the most insightful ever put to film. It’s not surprising, though, that it looks so ordinary. Film can be an amazing medium for so many things, but it’s often terrible at exploring the micrometers of nuance that make up a change of heart. It’s a medium of action, and belief is invisible. A film can communicate the aftermath of conversion, or convey relationships through conversations and acts, but the silent work of contemplation and kindling is harder to show. One of the reasons so many “faith-based” films feel so cheap and thin is that they ignore this—or worse, think that talking about belief is the same as showing it. They wind up delivering hollow homilies. They’re also designed to do the very thing Tender Mercies never once attempts: proselytize.